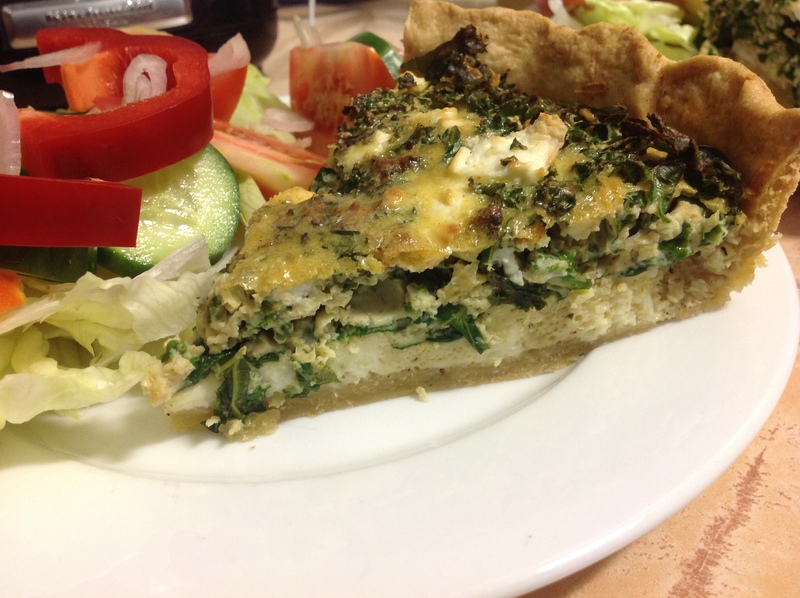 Kale, Spinach and Haloumi Quiche. I love making pastry and dough. 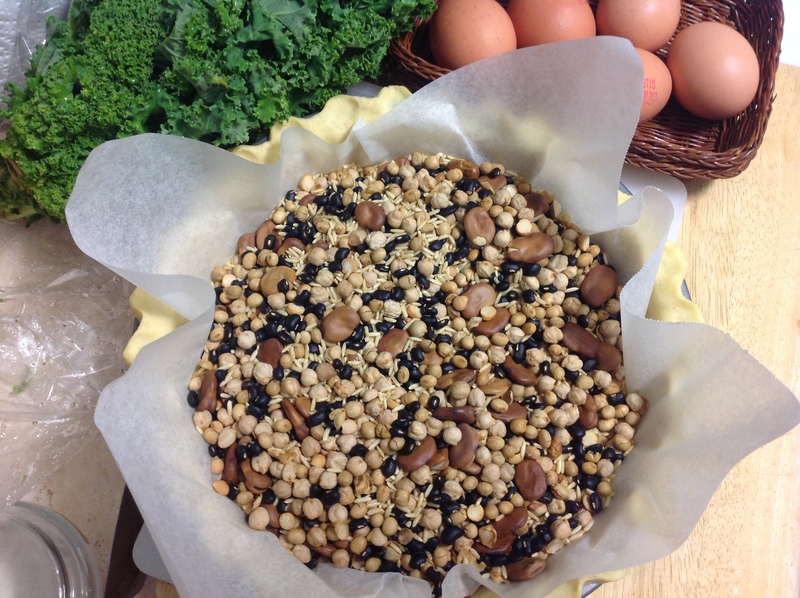 This recipe uses a really simple shortcrust pastry which can be doubled or halved very easily. It’s pretty much half the amount of butter to flour with a few tablespoons of cold water added at the end to bring it all together. Mix the two flours together then rub in the butter until it resembles breadcrumbs. Add the water and mix until combined. You don’t want to over mix or you’ll end up with a tough crust instead of a melt in the mouth crust. Turn the dough out onto a large piece of plastic wrap, flatten it a little then wrap and put in the fridge to rest for about 30 minutes. Now roll the dough out large enough to cover the base and sides of your tin. If you’re feeling creative you can crimp the edges. Put it back in the fridge for another 20 minutes to rest again (it’s very tiring being dough). Lightly blanch the kale in hot water, drain well the roughly chop. In a large bowl whisk the eggs and cream together. Season with salt, pepper, paprika and cumin then add the kale. 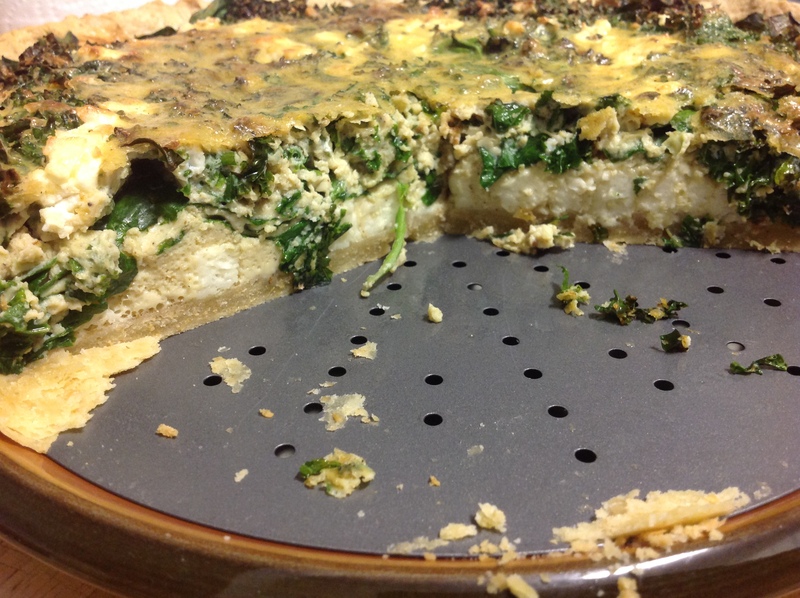 Take the crust out of the oven scatter the haloumi over the base, then the spinach leaves and finally pour over egg mix. 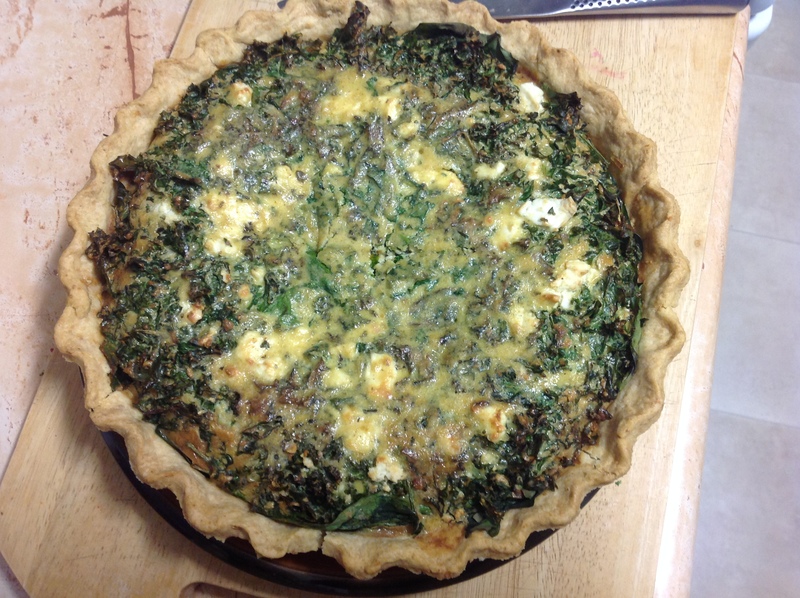 Flatten down a little with a spoon or palette knife and bake at 180oC for about 50 minutes or until the centre of the quiche is firm and the top a lovely golden brown. Serve with a fresh salad and a glass of wine. I haven’t made this side dish in ages which is a shame considering how much we enjoy it. With the spinach looking super fresh this morning at the green grocers, I couldn’t resist. 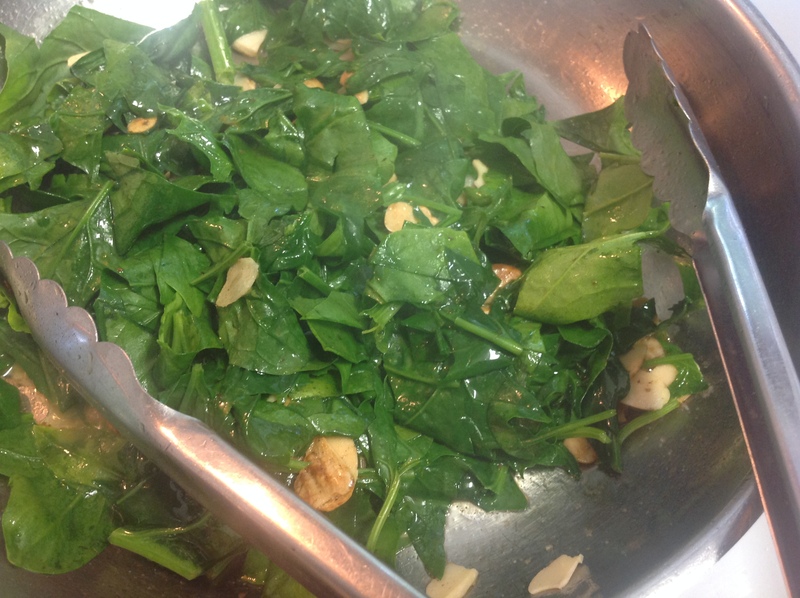 This can be made with baby spinach and if you like add some pine nuts. In a large fry pan melt the butter in the oil over a medium heat. 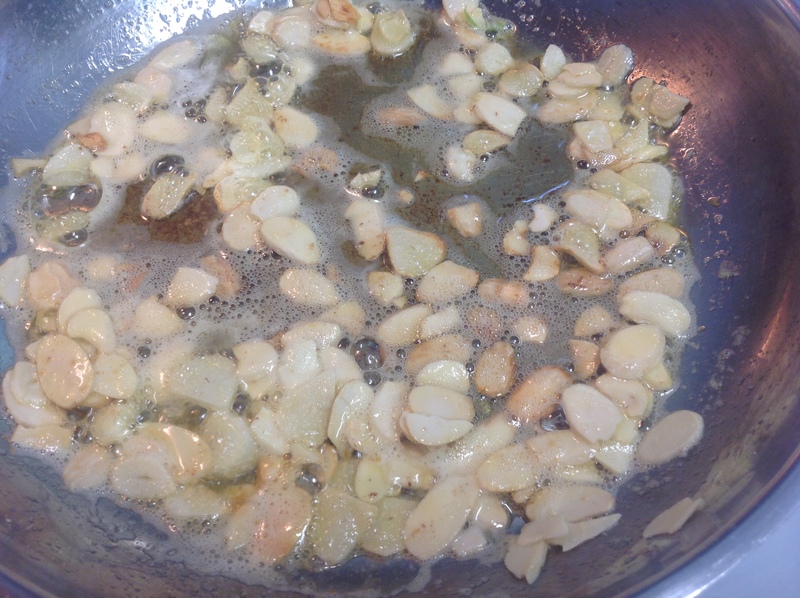 Add the garlic and almonds and sauté until golden brown. 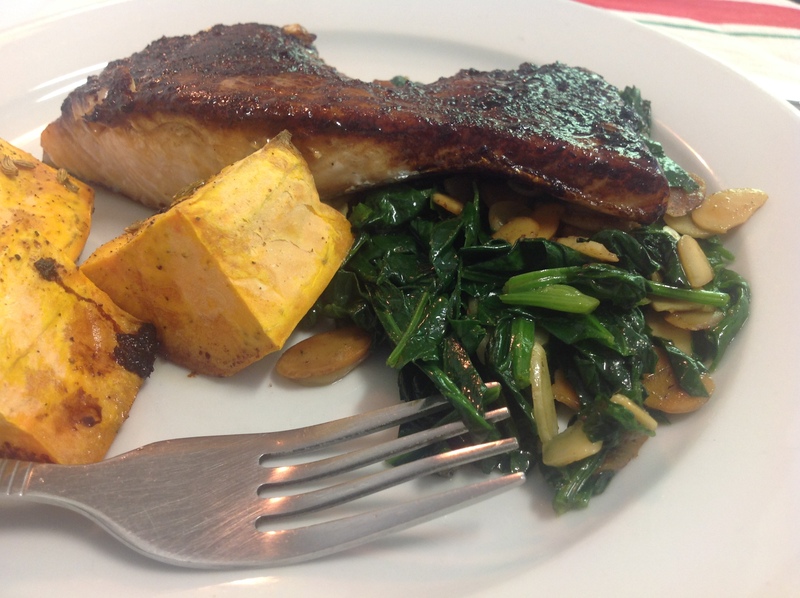 Throw in the spinach and lightly toss until wilted. Season with a little salt and pepper. 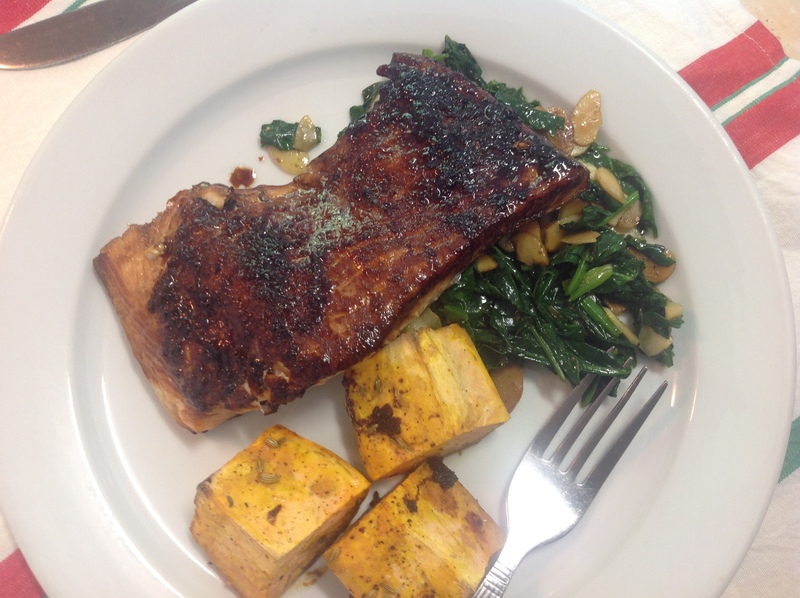 I served it with baked salmon fillets that I marinaded in garlic, ginger, sesame oil and soy sauce along with baked sweet potato and fennel seeds. It was a great combination. The left over sweet potato made an excellent addition to garden salad for the lunch the next day. Wow. It has been a long time between posts. Lets see if I remember how to do this. 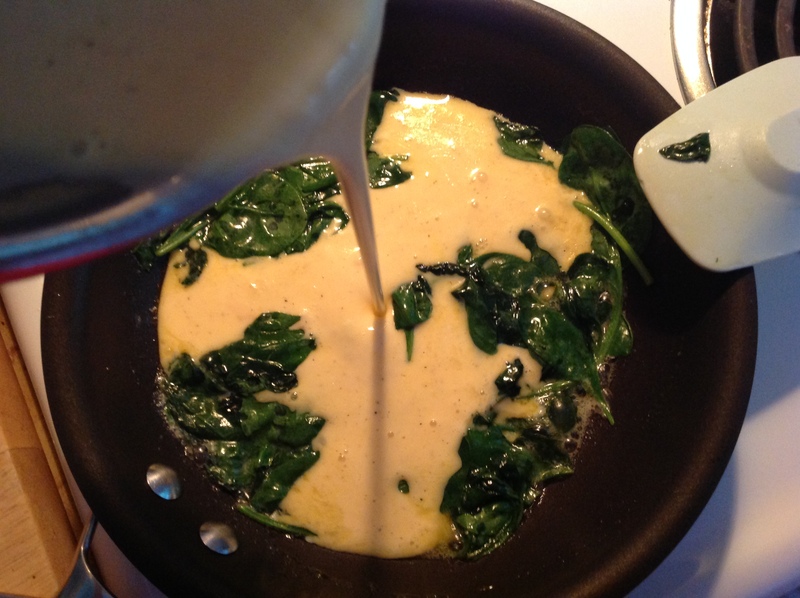 Melt a little butter in a small non-stick fry pan then toss in a couple of hands full of baby spinach. Let them sauté for a minute or so until they’re wilted. 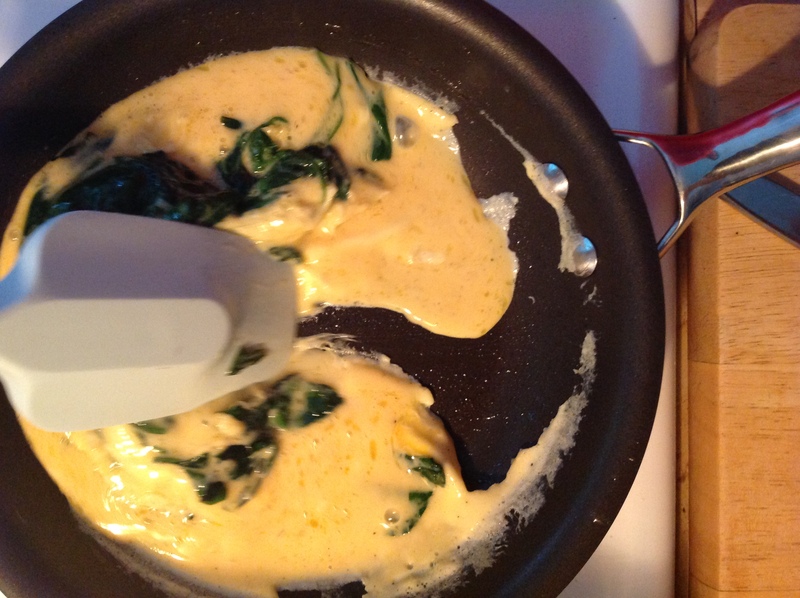 In a small bowl lightly whisk 2 eggs with a tablespoon of cream and a pinch of salt and pepper. 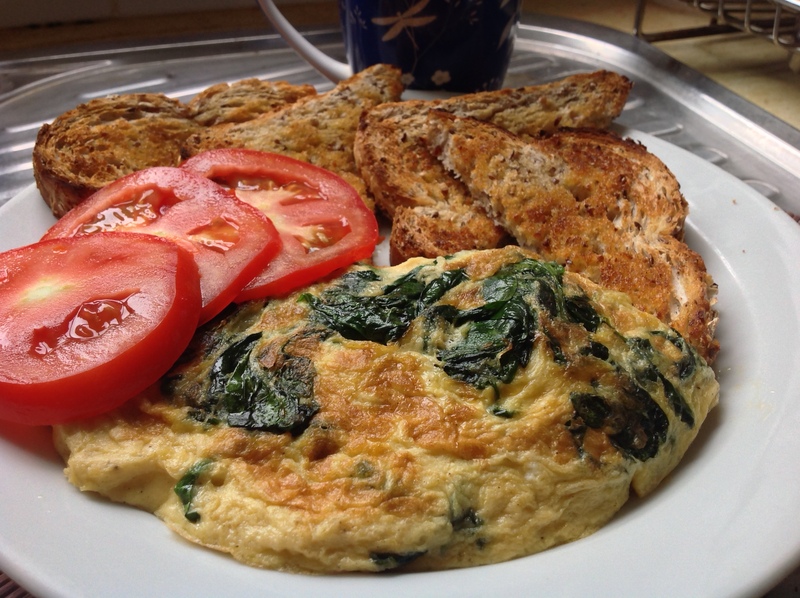 Pour the egg mix over the spinach and let it cook over a medium high heat for about a minute then carefully scrape the cooked egg into the centre allowing the uncooked egg to run to the sides of the pan and cook. Once it’s almost cooked either flip the omelette over or top with a little grated cheese and pop under a hot grill to finish of the cooking. 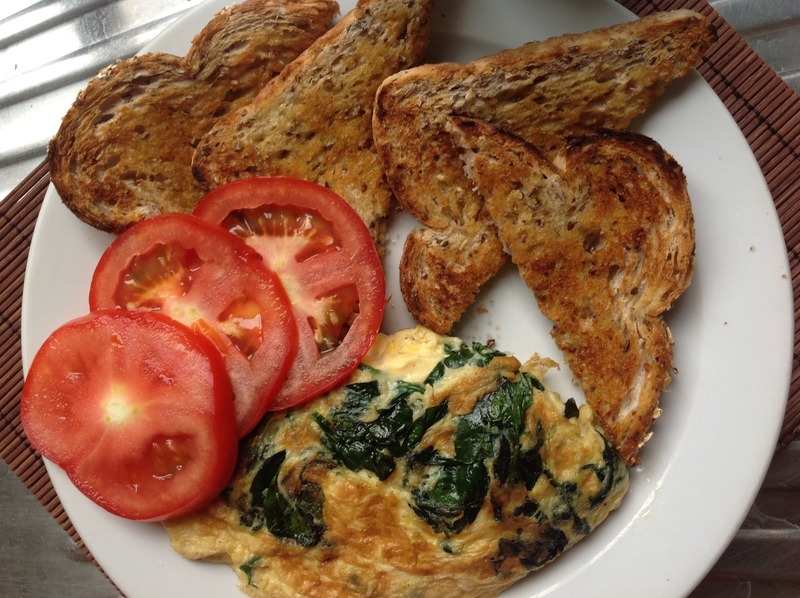 Served with some buttered toast and a few slices of fresh tomato or with some bacon or smoked salmon, this is a super quick and delicious meal. Mmmm…where did I leave my coffee??? It’s easy eating greens….especially when your mum’s neighbour grows lots of it. My mums across the road neighbour has a green thumb and a generous hand to go with it. No matter what she pushed into the dirt, it grows and so my mum gets all these wonderful freshly harvested veggies. Last week there was bags of silverbeet, kale and lettuce on my mums kitchen table when I went to visit. ‘Take what you want’ is all I needed to hear and I descended on those veggies with a bag of my own. 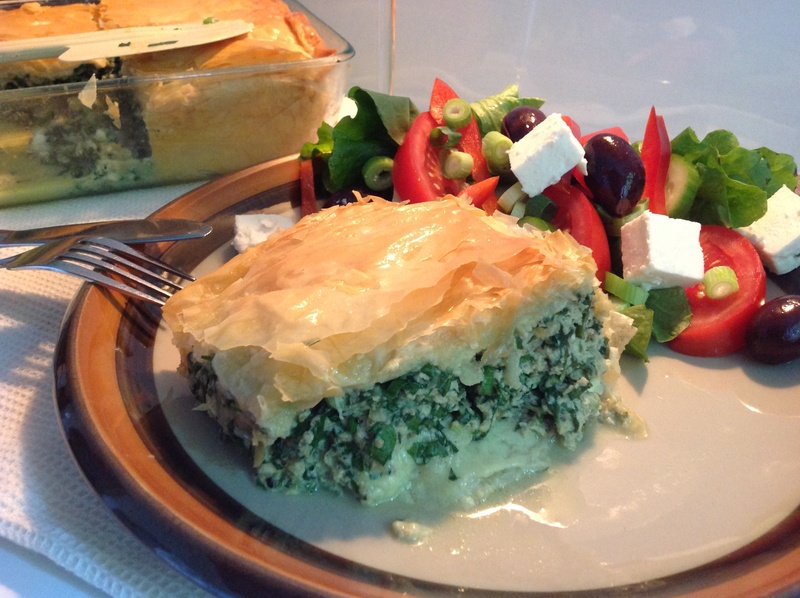 And so a wonderful filo pastry pie is on tonight’s menu. Unfortunately I didn’t really measure ingredients for this recipe but I’ll approximate. After washing and draining maybe half a bunch of silverbeet and half a bunch of kale I finely sliced them up and added them to a large bowl with 2 thinly sliced spring onions (mostly the green parts, the whites I put in the salad), 200g fresh ricotta cheese, 120g crumbled goats feta (cows feta works well too), a little sprinkle of salt (the feta can be salty, taste it), 1/2 tbls coarsely ground black pepper(put less if you not a big fan of pepper, we are), 1 tbls fennel seeds (yum), and 4 free range eggs. Mix really well until thoroughly combined. 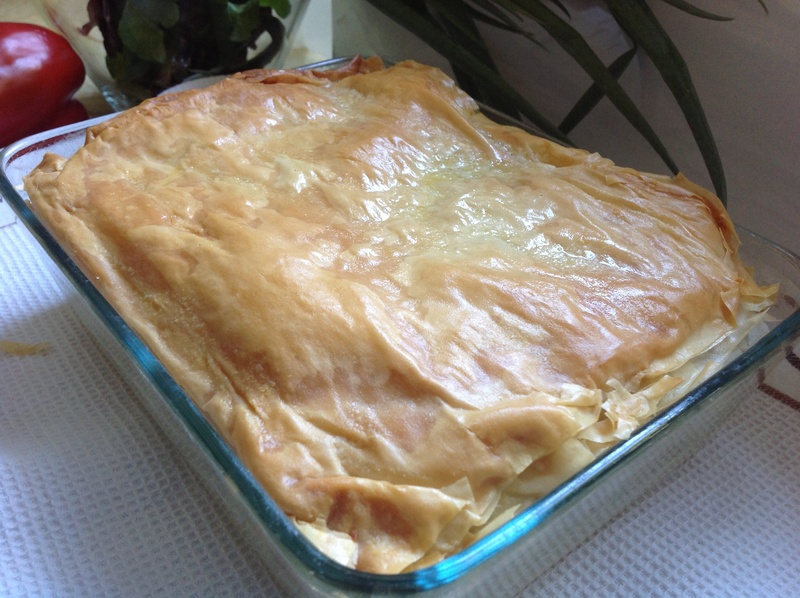 Next, melt some butter and brush a sheet of filo pastry with it, cover it with another sheet and brush with butter. Repeat this with another 4 sheets of pastry. 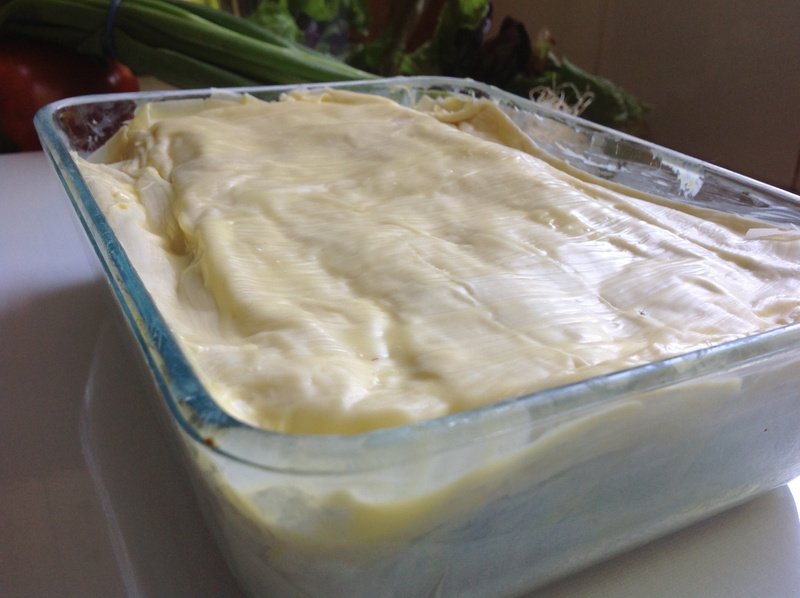 Fold the buttered sheets in half and line a buttered deep medium oven proof dish. Spread the spinach filling over the pastry and butter another 6 sheets as before. 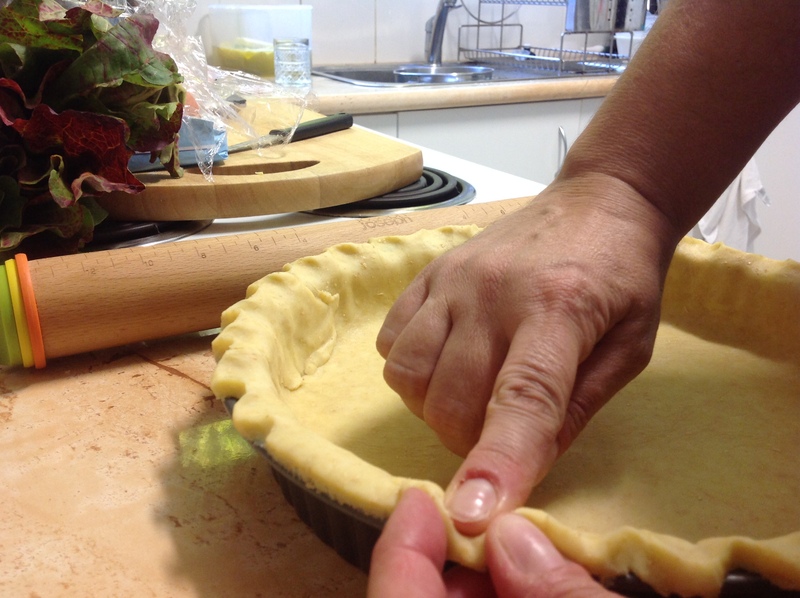 Cover the filling and tuck in the sides and edges. Brush liberally with butter and bake in a pre heated 180c oven for 45-50 minutes or until lovely and brown. Serve with a fresh salad and for the grown ups a chilled glass of white wine. ‘What could Lona possibly be making for dinner tonight?’, I hear you say. Well, I’ve never really been one for left- overs. I like to have something different every night. Don’t worry though. Left overs are used for lunches the next day. As for the corned beef, it was placed between two slices of multi-grain bread, smeared with mustard pickles and eaten by my husband at work this very day. I just munched on a slice that I topped with some of the bearnaise. Nice. However, today feels like a healthy soup day. Again. I love soup!! I went for a walk and picked up some silver beet. How about a lentil and silver beet soup. Hooray, I hear you all yell. here we go then – keep up – in a large pot, throw in 1/2 cup of brown lentils that you’ve rinsed, 3/4 fill the pot with water, bring to the boil, then turn the heat down. Cover and let it simmer for about 20 minutes. 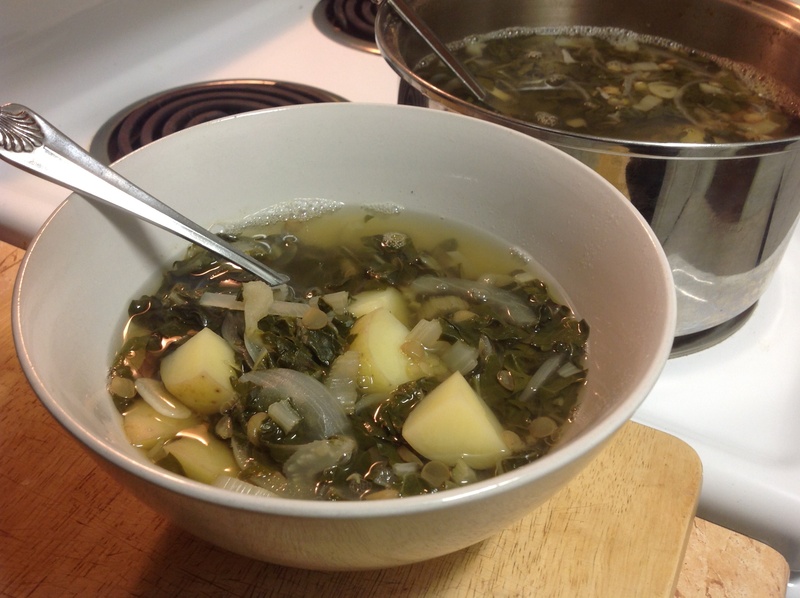 Add 1 bunch of silver beet (leaves and a little of the stalk), finely sliced and rinsed, 1 large onion – cut in half and thinly sliced, 2 cups of diced potato, as many garlic cloves as you can handle, ( I usually put in about 7 or 8 large ones), chopped. Stir it well, cover, increase heat to bring it back up to the boil, then lower heat and let it simmer away for another 45 minutes or so until the potato and lentils are cooked. Season with salt and pepper to taste. Squeeze in the juice of 1 lemon. This I usually serve with some toasted Lebanese bread. one of my favourite all time soups. This will serve four people.